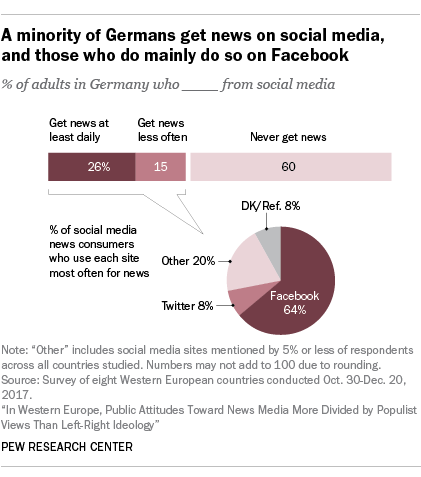 Below are specific findings about news media attitudes and habits in Germany. The findings come from a Pew Research Center survey about news media and politics across eight Western European countries conducted from Oct. 30 to Dec. 20, 2017. The survey covered five countries in the north (Denmark, Germany, the Netherlands, Sweden and the United Kingdom) and three in the south (France, Italy and Spain). CORRECTION: This fact sheet was updated on May 22, 2018, due to the possibility that the language used to identify the German news outlet Die Tageszeitung may have confused respondents. References to that outlet have been removed throughout. There were no substantive changes to the report’s conclusions. 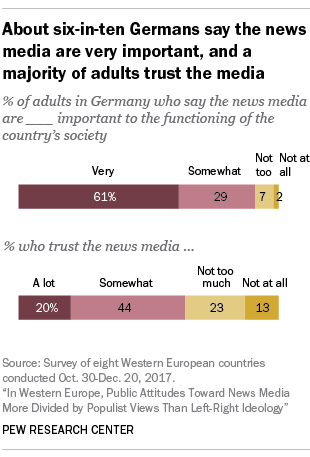 A majority of German adults (61%) consider the news media very important to society. Similarly, around two-thirds (64%) say they trust the news media. This includes one-in-five who trust the news media a lot. 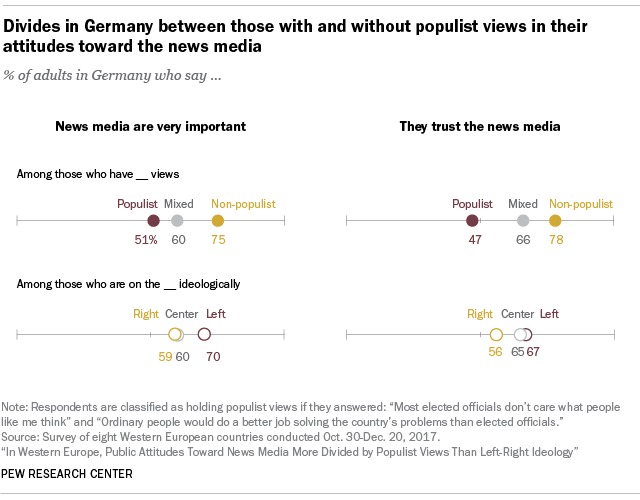 Populist divides in media attitudes are strong in Germany as well: 47% of people with populist views say they trust the news media, compared with 78% of those without populist views. On the question of importance, 51% of those with populist views say the news media are very important for society in Germany, compared with 75% of those with non-populist views. 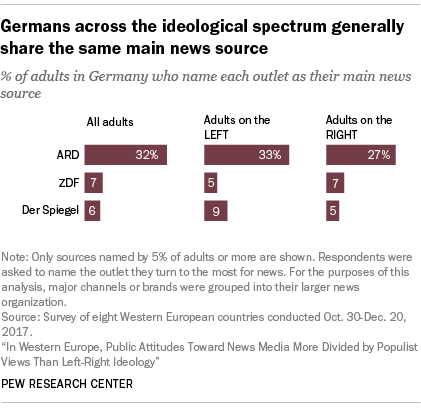 In Germany, those on the left and the right do not differ in regard to the media source they turn to most for news. Both those on the ideological right and left cite ARD as their main news source. Germany is an exception. 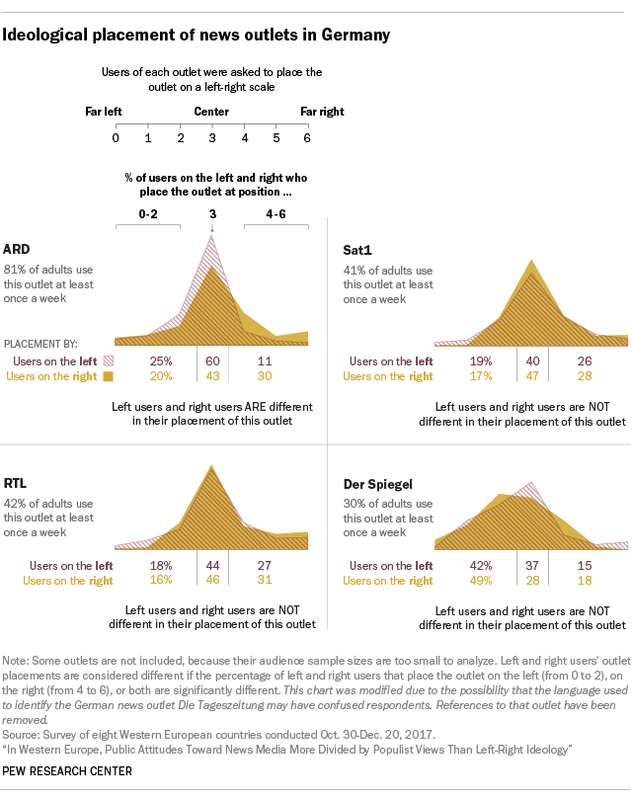 Not only are most German outlets’ news audiences near the center, but people who have heard of the outlets also tend to place them near the middle of the left-right spectrum. In seven of the eight countries surveyed, the most trusted news outlet asked about is the public news organization in each country. 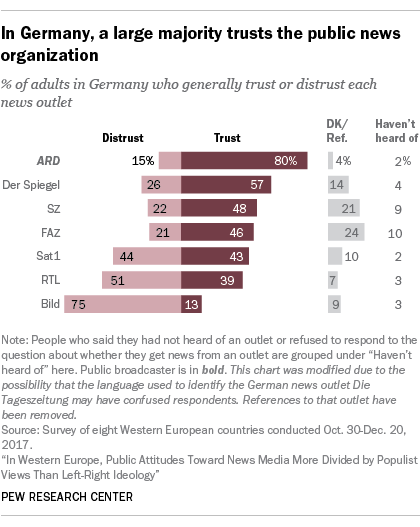 In Germany, eight-in-ten say they trust the public news organization ARD. In Germany, for example, those with populist leanings are 29 percentage points less likely than those with non-populist views to say they trust FAZ. Trust is also divided along the left-right ideological spectrum in Germany – those who place themselves on the left of the 0-to-6 ideological scale are 15 percentage points less likely than people on the right to trust RTL. Among German adults, 41% get news on social media, including around a quarter (26%) who get news on social media daily. Facebook is the most common social network used for news. In Germany, young people (those 18 to 29 years old) are more likely to get news on social media daily than those 50 and older (50% vs. 11%). 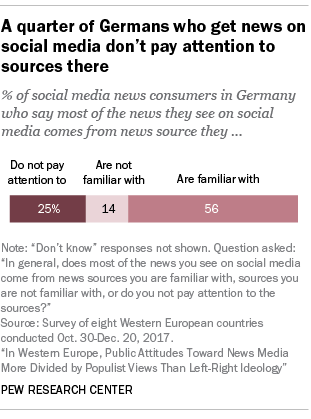 Social media news consumers in Germany are similar to other Western Europeans – 56% are familiar with the news sources they find on social media, but a quarter do not pay attention to the sources there.